McDonogh School, where the late Jordan McNair played football, retired his No. 70 jersey in a ceremony Friday afternoon in Owing Mills, Maryland. 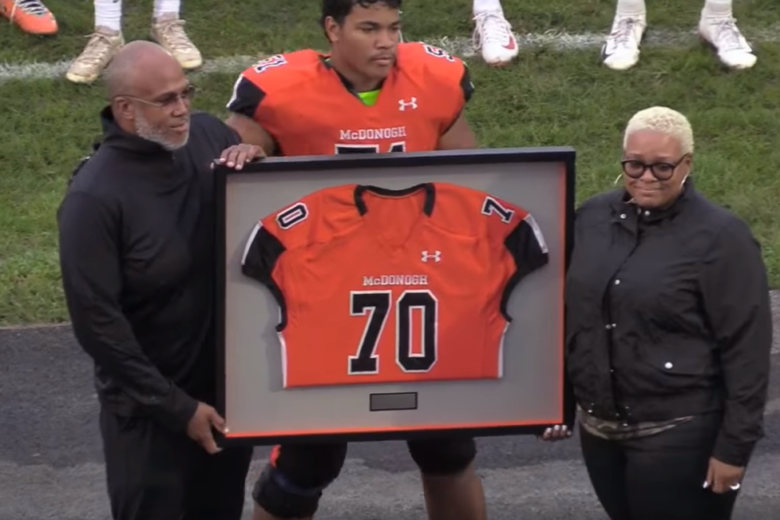 WASHINGTON — McDonogh School, where the late Jordan McNair played football, retired his No. 70 jersey in a ceremony Friday afternoon in Owing Mills, Maryland. McNair was remembered at the high school after his death earlier this year. He suffered a heat stroke during condition training at the University of Maryland in his first year. Athletic Director of McDonogh School Mickey Deegan read football coach Hakeem Sule’s speech, given at McNair’s funeral in June. “I think it will help all of us understand Jordan as the gift that he was to our community,” she said. “What amazed me about Jordan was that he understood his purpose in life. And it wasn’t just football and academics. For Jordan, it was understood that he was designed to lead and to love,” Deegan read aloud. McNair’s parents, Tonya Wilson and Martin McNair, were given a framed No. 70 jersey with McNair’s name and number on it by the team’s captains. Another No. 70 jersey will be displayed in the Athletics Center “forever, in memory of Jordan,” Deegan said. Jordan’s father gave a speech at the ceremony as well. “The last time we were here on the field was … Jordan’s senior year, and we were full of expectations and with a life full of potential. Things happened. However, Tanya and I are proud to be part of the McDonogh family … The relationships that he made here; as Ms. Deegan said, it just wasn’t us as family, it was a whole village that raised Jordan,” Martin McNair said. A senior then sang the national anthem before the school’s team played against Malvern Prep. McNair was a 2017 graduate of McDonogh School.